Has Gilt Groupe hit the clearance rack? Gilt Groupe, the queen of luxury deals, may have just been marked down. Gilt is reportedly in talks to be acquired for $250 million, a fraction of what it was once valued at. The company -- one of the originators of the flash sale model -- was valued at over $1 billion in 2011. The The Wall Street Journal reported Monday that Hudson's Bay, the parent company of Saks Fifth Avenue, is said to be interested in purchasing Gilt. Founded in 2007, Gilt Groupe is one of the most popular flash sale sites. Customers are able to purchase luxury fashion items at 70% off during sales that typically last 36 to 48 hours. Its user base has soared over the years. In 2009, it had 1 million members. In 2011, it had 5 million. Today, it counts 9 million. But daily deals sites are starting to look like a fad. Amazon (AMZN) recently shut down its local deals site. Groupon (GRPN) has struggled on the public market. One Kings Lane and LivingSocial have both downsized recently. And while Gilt's userbase has steadily grown, its unclear how many users are actually making purchases: Gilt's revenue hasn't grown in kind. The company is on track to bring in $600 million in 2015. That's down from $660 million in 2014, according Evan Danckwerth, analyst at PrivCo. When Gilt raised $138 million from Goldman Sachs in 2011, analysts saw it as a sign that the company was gunning for an IPO -- and that Goldman would serve as underwriter to the company's IPO. But the company remained private. 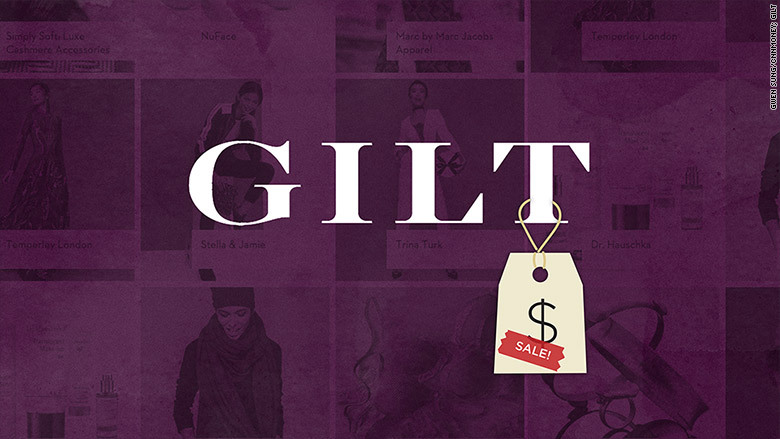 In February 2015, Gilt raised $46 million and got a hefty markdown. According to research firm VC Experts, it was valued at just $600 million. At that time, the company also converted the stock of some of its investors, marking down their share price from $27 to roughly $7, according to VC Experts' Justin Byers. Analysts say this isn't the case of a company staying private due to an unfriendly public market. Instead, it has everything to do with the daily deals business model. "A lot of the challenges that the flash sales have had since the beginning are being reflected [in Gilt] ... . It was always hard to acquire customers, retain customers, acquire inventory," said Sucharita Mulpuru-Kodali, research analyst at Forrester. "I don't know why [Gilt] is not profitable yet ... unless it just speaks to how terrible the model is." Gilt has cut back on its workforce and shed ancillary businesses over the years. In 2013, Gilt brought on Citigroup's Michelle Peluso as CEO to help streamline the business, which today has fewer than 900 employees. "A lot of us were skeptical that these businesses would ever deliver against expectations," said Mulpuru-Kodali.